West of the city, Hinton and Edson marked 20 cm of snow yesterday. Flurries in Lake Wabumun sent campers scurrying for cover, said Kokanee Springs RV Park owner Len Quaghebeur. The crummy weather also forced the closure of Edmonton’s Mill Creek outdoor pool, which was scheduled to open over the long weekend. When I lived in Edmonton in the seventies (as a teenager) it we occasionally had similar weather but I don’t recall it snowing in mid May! That’s a bit extreme. Well since my memory is scientific in this case let’s look at the historical data and see what it shows. 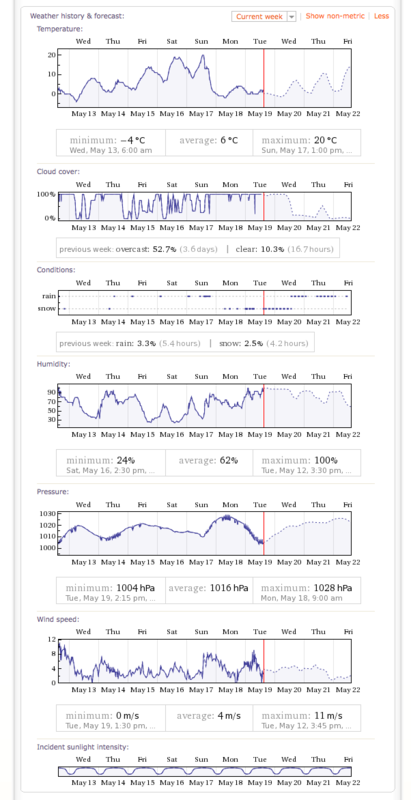 Historical weather data from weather station CYXD via the Alpha Wolf. Well, we can see that it’s been warmer for the last while until this dip and then there are a couple of other low spikes for this date all the way back to the early 1970’s. 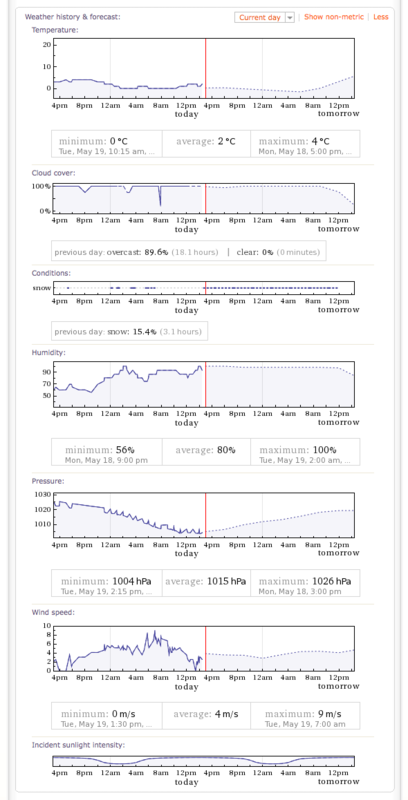 That’s cool this weather station has more historical data than the one for Vancouver which only goes back 10 years. So 1987 had a -3 on this day. 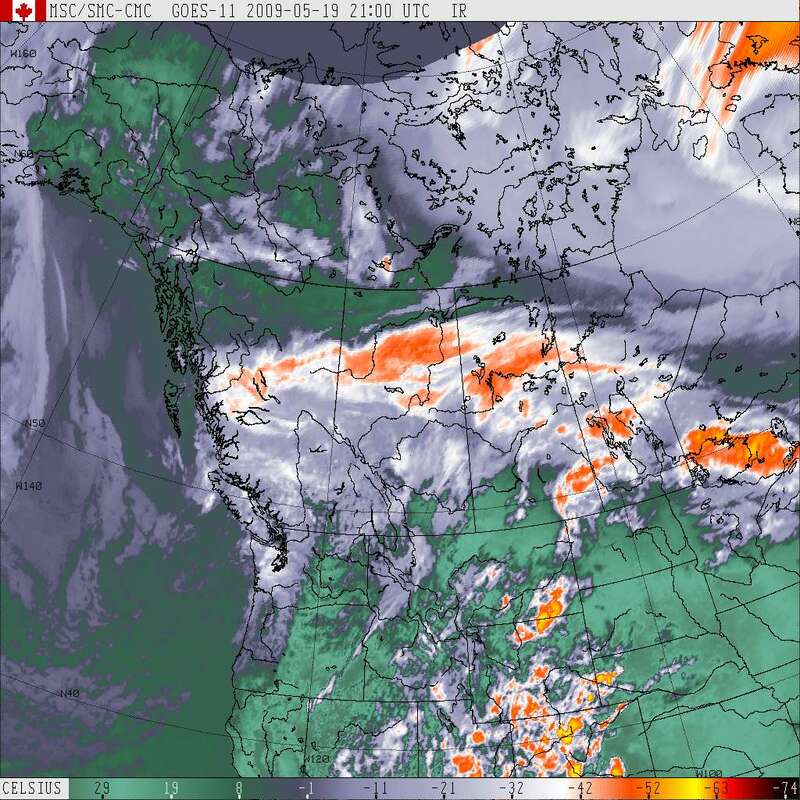 Satellite Image of the “weather front” over the Edmonton area. Note the temperature scale of the clouds. 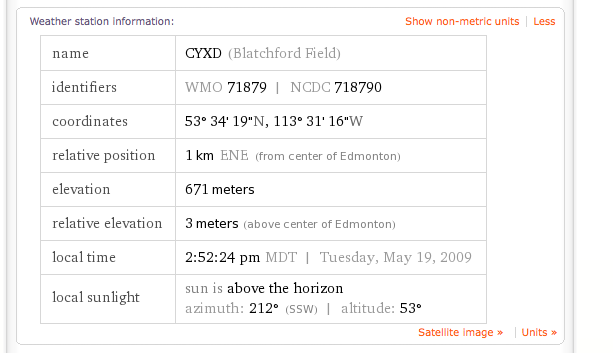 To find Edmonton look for the bend on the western border of Albert and move east to about the center of the province and that’s generally where Edmonton is or see this map of Alberta (click to zoom in). Hinton is west of Edmonton in the foot hills of the rocky mountains. Today’s current weather and projection (dotted lines). This week with today and projection for the rest of the week (dotted lines). You clearly can see this anomaly dip down. Oh, is it an anomaly, nah, it’s climate, oh pardon me, it’s weather, oh wait, it’s weather within the climate range… it’s BOTH weather AND climate! Wow! Weather station location station nerds to photograph and audit. Anyone got photos? Finally the official weather forecast from those soothsayers in the know. Snow mixed with rain. Snowfall amount 2 to 4 cm. Wind southeast 30 km/h becoming light near noon. High plus 3. Snow. Snow mixed with rain early this evening. Wind northwest 20 km/h gusting to 40 becoming light near midnight. Low plus 1. Light snow ending near noon then cloudy with 40 percent chance of rain showers. Becoming cloudy periods in the evening. Wind northwest 20 km/h. High 9. Sunny. Low minus 1. High 13. Sunny. Low minus 3. High 17. Sunny. Low 6. High 20. A mix of sun and cloud. Low 8. High 20. 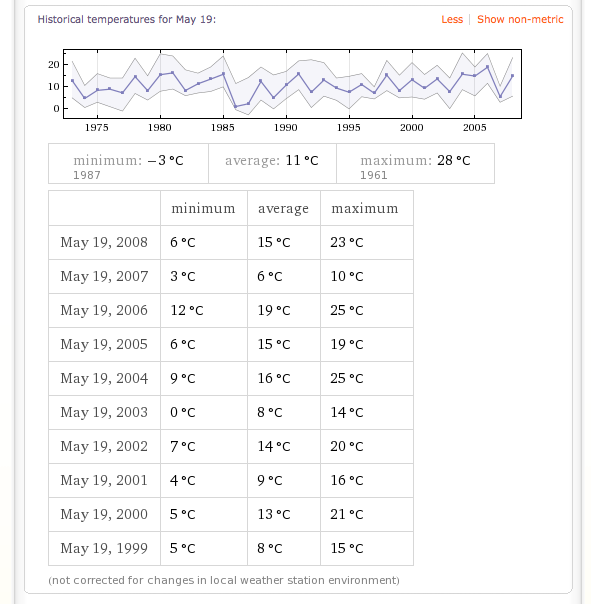 This entry was posted on May 19, 2009 at 1:25 pm	and is filed under Climate Science, Humbled by Nature, Ignorance to Knowledge, It's weather AND climate!, Rational Thinking, Science Education, Science over Propaganada, Science Smackdown, The End is Nigh, The Sky Is Falling, Yeah Right. You can follow any responses to this entry through the RSS 2.0 feed. You can leave a response, or trackback from your own site. May 20, 1986… one of Calgary’s record dumps of snow. May long weekend: traditionally considered in Alberta as the most likely time to experience snow while camping… more reliably even than during winter. However, this HAS been a less than “warming” year, that’s for sure! We’re currently in a pattern of just barely reaching “room temperature” for a day or two, then down to cold and wet for a few days. In other words, it’s a cold, dismal weather year, but not outside the range of normal… which is the key I keep trying to remind people of. I’ve never in my life experienced any weather that was outside the range of normal, but have been amazed watching people during every weather event, cold snap, heat wave, as they act like they are seeing the most unusual thing ever.